China, South Korea and Japan are all vying for influence in ASEAN, which will be on full display next week. The government shutdown in the United States may have forced President Obama to cancel part of his visit to Southeast Asia next week, but the region will not be in want of courters as it prepares for the Asia-Pacific Economic Cooperation meeting in Indonesia and the East Asia Summit in Brunei. In particular, the battle for influence in the ASEAN region among Northeast Asian’s major powers—China, South Korea and Japan—is intensifying. China has a clear head start in this competition, having steadily accumulated influence over the last decade since signing a strategic partnership with ASEAN in 2003. That same year, China became ASEAN’s first dialogue partner to accede to the organization’s landmark Treaty of Amity and Cooperation, a move many other external powers have since made. Economic cooperation has been the main cornerstone of China and ASEAN’s growing ties. 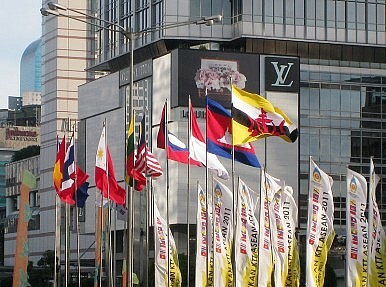 In 2009, China became ASEAN’s largest trading partner as Southeast Asia sought to capitalize on China’s booming economy. In January 2010, the two sides concluded the ASEAN-China Free Trade Agreement (ACFTA) following the signing of the Framework Agreement on Comprehensive Economic Cooperation eight years prior. In the year after the FTA, bilateral trade grew by over 20 percent, from US$232 billion in 2010 to US$280.4 billion in 2011. The increase was heavily weighted towards an increase in China’s imports from ASEAN countries, which jumped more than 28 percent from 2010 to 2011, making Southeast Asian economies ever more reliant on the Chinese leviathan. An opportunity for other powers has opened up in recent years as China-ASEAN relations have deteriorated with Beijing’s greater assertiveness in the South China Sea. In pursuit of this end, China has continued to insist on a bilateral approach to handling disputes, so that it benefits from its influence over its smaller neighbors. This has exposed deep-seated fissures within ASEAN and arguably poses the greatest threat to the organization’s long-term viability. Still, the Xi Jinping administration has sought to reduce tensions with most ASEAN nations throughout the year by sending senior officials to the region and welcoming ASEAN heads of states to China. Chinese Foreign Minister Wang Yi, for instance, made ASEAN the destination of his first overseas visit back in April, and returned to the region in August. He is also accompanying President Xi Jinping on the latter’s first visit to the region since taking over China’s top political positions. Specifically, President Xi is making state visits to Malaysia and Indonesia this week ahead of the APEC summit in Bali and the EAS in Brunei. These visits were given significant coverage in the Chinese state press ahead of Xi’s departure, which has continued during the trip. In Indonesia, Xi became the first foreign leader to address Parliament, and the two sides concluded trade and investment deals worth US$28.2 billion. Arriving in Malaysia early on Friday, Xi is likely to continue trying to temper concerns about the South China Sea, given that Malaysia lays claim to parts of it. Nonetheless, he will continue to try and keep the focus on economics, a feat that should prove relatively easy as China has surpassed the U.S. as Malaysia’s top trading partner. South Korean President Park Geun-hye is also traveling to the region for APEC and EAS, before returning to Indonesia for her own state visit, which begins on Thursday of next week. Although attracting much less attention than China’s efforts, Seoul has quietly expanded its influence and economic cooperation in recent years. Last year, for instance, ASEAN became South Korea’s second biggest trading partner behind China, and also Seoul’s top destination for investment. The relationship is maintained through a number of institutions and agreements, including the ASEAN-Korea Centre, the Korea-ASEAN Free Trade Agreement and a strategic partnership. President Park’s itinerary suggests economics will remain at the heart of her trip to the region this week, as she will be participating in the APEC Economic Leaders' Meeting and APEC Business Advisory Council, as well as delivering a keynote address at the CEO Summit. In Brunei for the EAS, Park will also meet with leaders from the 10 ASEAN countries for the 16th Korea-ASEAN Summit. She will also attend the ASEAN+3 meeting, before returning to Indonesia for a state visit. But 2013 is most significant for marking a return of Japan to the region. Although in the foreign policy context, Prime Minister Shinzo Abe has been most notable for his historical comments, military ambitions and dispute with China over the Senkaku/Diaoyu Islands, his reassertion of Japanese influence in ASEAN will perhaps have the longest-lasting consequences of all. In his first seven months in office, Abe personally visited Southeast Asia on three occasions. By the end of the first year of his second term he will have visited the region at least five times, including stops in all 10 ASEAN nations. In between his personal trips, senior Abe administration officials have also called on the region. This renewed interest is undoubtedly driven by Japan’s island dispute with China, and Abe has certainly tried to draw parallels between China’s maritime claims in the South and East China Seas. While in the region he has presented himself as eager to find a way to thaw ties with China in the hope that Southeast Asia will view China as the bully in the East China Sea just as many ASEAN nations perceive it to be in the South China Sea. Abe has also focused particular attention on nations—like the Philippines and Myanmar—that are seeking for their own reasons to distance themselves from China. Still, taking a page out of China’s book, Abe has also vigorously tried to deepen economic cooperation between ASEAN nations and Japan. Most notably, Abe has sought to drag a very reluctant Japan into the Trans-Pacific Partnership agreement. He is also urging large investors at home, including entities owned by the government, to take risks in investing in emerging economies in Southeast Asia. There have been some suggestions that Abe will send more Japanese language teachers to ASEAN countries in an effort to increase cultural ties with Southeast Asia. Unlike his South Korean and Chinese counterparts, in the upcoming week Abe will not be making any state visits in Southeast Asia, but will be attending the APEC and EAS meetings, as well as engaging in various activities on the sidelines. Still, he plans on making at least one more trip to the region to visit Laos and Cambodia later this year. Ultimately the main story in ASEAN’s foreign affairs in 2013 is the reemergence of Japan.